Arizona Prison Watch: FEB 11: Bill Montgomery to meet with AZ Mental Health and CJ Coalition. 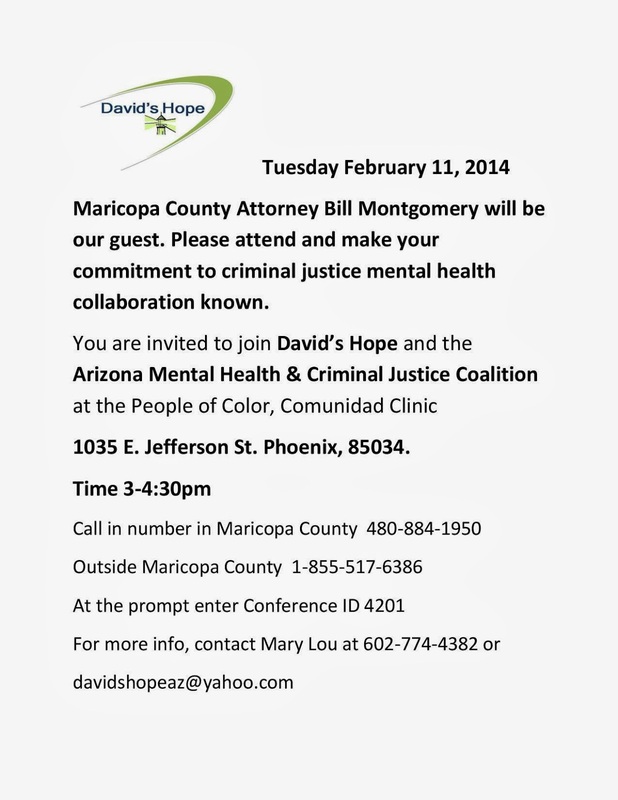 FEB 11: Bill Montgomery to meet with AZ Mental Health and CJ Coalition. This looks worth hitting, and I hope people come with the tough questions for Montgomery that you always bring up with me. Among the things I'm concerned about: imprisoning people with mental illness who enounter the CJ system due to their symptoms; charging seriously mentallly ill youth as adults; the over-charging of defendants and prolonged pre-trial incarceration of the mentally ill to coerce unfair plea deals; and evidence of wrongful convictions he's refusing to look at - the whole question of prosecutorial integrity and misconduct. One such example of wrongful convictions under Andrew Thomas is that of Courtney Bisbee. Over 40,000 people on Change.org have read her accuser's recantation, admitting he purjured himself in her trial, and know there's an affidavit in the possession of the MCAO - and yet Montgomery refuses to facilitate a re-examination of her case. Finally, I have pretty strong feelings about criminalizing immigrants who perpetrate no greater harm on the community than holding down a job and contributing to some poor american's social security fund - he clobbers them with multiple felonies to coerce plea deals that will deprive them of future rights and may result in immediate deportation. His policies and practices when it comes to charging immigrants with work-related crimes are vicious, and results in harm to families and communities far beyond that which he purports to be preventing.